Looks like it was a beautiful fall day in Evanston, where this image of the Chicago El — here running at street level (gasp!) — was taken on Sunday. Seeing this picture here is my biggest surprise for the day. I went to grade school about 3 blocks away from this crossing and took that train home. That’s Maple Street looking North into Linden Station. And it’s actually in Wilmette, one block North of the Evanston border. 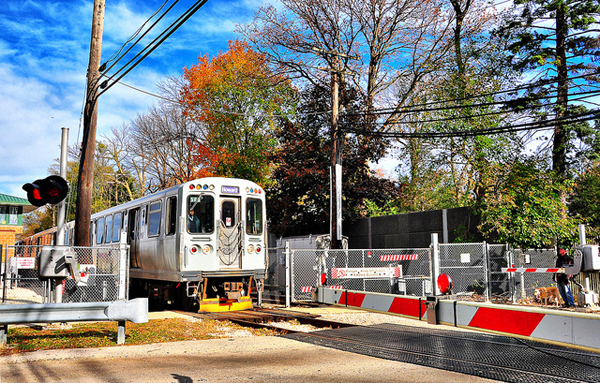 This is one of two at-grade crossings on the North end of the Purple line (Isabella Street is the other). The El also has a few other at-grade crossings towards the ends of the Yellow and Pink lines. You may notice that the train has no power as it crosses the street– All the at-grade crossings have a gap in the third rail. It’s possible for a short train to become caught in the gap.